September 13th is National Fortune Cookie Day. 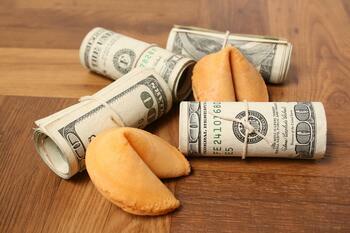 While many fortunes are a bit silly, some cookies actually have some decent financial advice. Check out a few of our favorites. Whether it’s saving up for that dream vacation or retirement, it’s going to take a little time. Just keep reminding yourself of what you are aiming for every time you make a deposit in your account. It will all be worth it in the end. There are several different types of accounts that Cyprus offers to help you start saving today. YOU WILL RECIEVE A LARGE SUM OF MONEY. One can only hope, right? If you do find yourself coming into a large amount of money, an investment professional can help. They'll show you how to take a proactive approach to your personal financial situation and gain a better understanding of the financial concepts behind insurance, investing, retirement, estate planning, and wealth preservation. YOU WILL HAVE A LOT OF LOVE IN THE FUTURE. Is that wedding bells we hear? Or maybe there’s a new baby on the way. Whatever it may be, now is the time to make those all important financial changes in your life. Whether it’s combining your finances as a married couple, planning for the future, or purchasing that first family home. BE CAREFUL NOT TO OVERSPEND. As if you needed one more reminder about this. It does not, however, mean cut all of the fun out of your life, it simply means to make smarter decisions. Budgets with no room for fun often fail, leading to even more financial trouble. So go ahead and see that movie or go out to dinner with your friends, just remember to use good judgment and stay on budget. SUCCESS WILL COME TO YOU SOON. Maybe you’re close to graduation, that promotion, or a headed down a new career path. If you’re willing to wait for it and work hard, you will find success in your life. Keep on going, we know you can do it!